Gokkaya, which has plenty of bays and coves. Combine your cruise with a stay in our luxury 3 bedroom villa which sleeps up to 6 guests, Ask me for details. 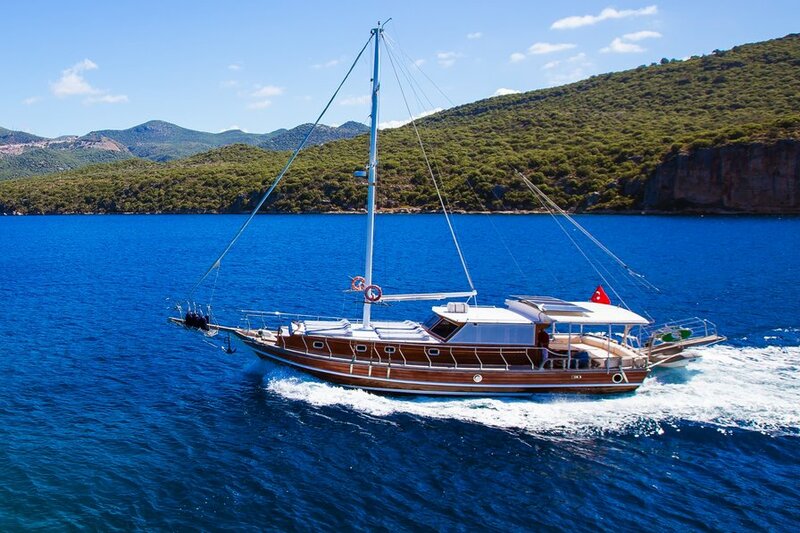 Our 55ft ( 16 mt ) Gulet is available for daily & overnight charters & cruises has ample space for comfortably lying in the shade or sun bathing, as well seating areas and tables. We have 3 cabins with their own en suite bathrooms. Each journey begins with a cool towel service and discussion with Captain Ergun on details of the boat and numerous trip options. When guests are ready for lunch, our team utilizes our full kitchen and grill to cook a customizable fresh meal, which always includes multiple options and dessert. We also offer an afternoon tea and coffee service for those guests interested in partaking. No matter which trip you choose, you will always enjoy delicious food and drinks and a memorable day of sailing, snorkelling and swimming in the dazzling Mediterranean Sea. Villa Rental, Holiday in a Hotel…none comes close to the experience of travel by BOAT! Let’s explore why: Firstly, you can comfortably move around, lie down, or sit at a table whilst your vessel glides along the sea. You are surrounded by ever changing natural beauty. You can fall asleep while travelling, or at night while anchored in a pristine bay, amidst the sound of waves lapping against the boat’s sides. Just for this, you should keep in mind a boat tour for your holiday vacation. We believe that everyone who chooses Kas as their destination should not miss out on this crewed yacht charter to complete their Kas experience. The perspective of Ancient Lycia from the sea is unbeatable. If you prefer to avoid people you don’t know as you relax in your swimming costumes; if you prefer to be alone with your loved ones and friends on an affordable boat journey, our tours are designed just for you! Shared between 6 people, this is only £187 per person for a 24 hour cruise. ALL INCLUSIVE on board. Includes all meals, diving, fishing, snorkelling, kayaking, visiting wonderful islands, with white sand beaches and crystal clear water. BBQ on the boat and dine on board. There is nothing else to pay. There are 3 luxurious cabins, which can sleep up to 6. All en-suite bathrooms, air-con. Please ask to see my website for all further information. I can arrange overnight charters, or 36 hours, or longer. I also have smaller, and much cheaper, yachts for charter out of Turkey. Also day charters are available. Please note we also have a luxury villa in Kas / Turkey which can sleep up to 20, so you can combine the two for your Turkey holiday.